Don’t we have enough things to collect? Apparently not. Squinkies recently caught my attention so I decided to take a closer look. A friend recently came back from a trip to Japan and upon welcoming him back he told me that I would have loved Japan. It’s crowded, loud, bright, and full of arcades. It’s nice to know that I’m known for something. As he told me stories about the arcades and bright lights, he talked about a toy store that had nothing but capsule toys…you know, those cheap toys that come in clear plastic eggs that you find in the doorways of grocery stores. We know these machines mostly as a way to keep small children quiet with a rub-on tattoo, sticker, or superball, but in Japan where they take collecting a little more seriously, these capsule toys mean a little bit more…so much more that the store my friend visited was six stories of just capsule vending machines. Now that is some serious collecting. 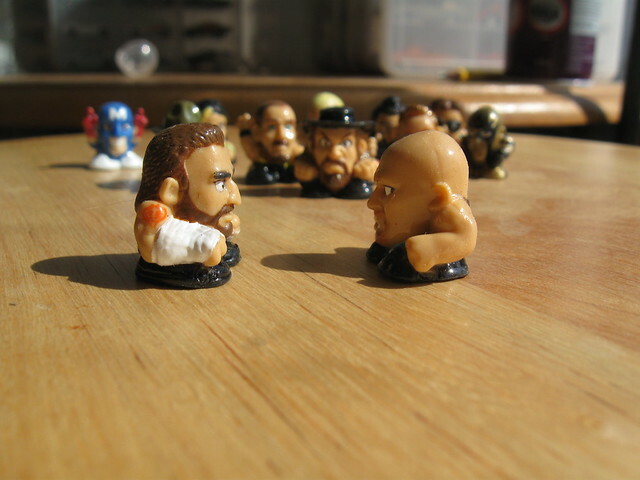 WWE Squinkies. Stone Cold Steve Austin in a bubble. The name “Squinkie” might sound like some sort of child-safe expletive, but it is fun to say and these little figures are fun to look at. They caught my eye because of the display case. The case had what was probably 50 individual Squinkies all lined up, just tempting me to buy a pack and start a new addiction. Each Squinkie is about the size of a penny, so they’re very small, which makes them all the more adorable (and dangerous). However, the other reason I took notice of them was because they were all licensed characters. There was a pack of Marvel superhero characters, a pack for Toy Story, Cars 2, and a pack for WWE wrestlers. Being the wrestling fan I am, I grabbed one of the last WWE packs to check out. Each carded pack includes 12 Squinkies, which I have to say isn’t a bad deal, even for the $9 asking price. 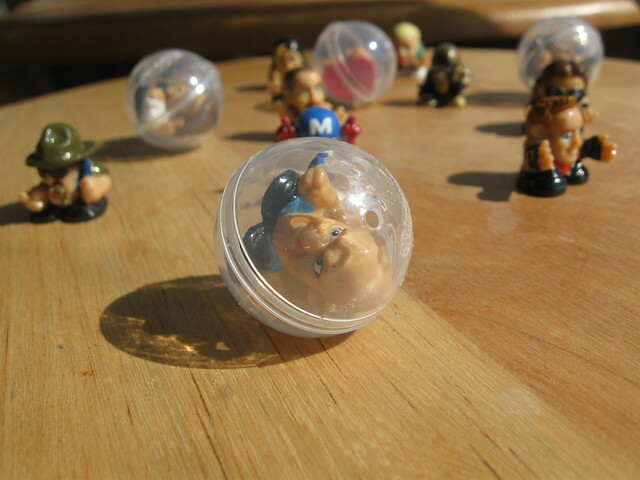 Each Squinkie comes in a plastic capsule ball. Crack open one of these plastic eggs and unlock all the fun that is Squinkies….okay, so there’s not much fun to be had but they look kind of cool. Squinkies are made of squishy rubber that reminds you of Wacky Wall Walkers, only they don’t stick to the wall, but they do pick up dirt, hair, and dust very easily. Now I know why they come in plastic eggs. In the case of the WWE pack I got, each Squinkie is little more than a head with some short, stubby legs and arms. Each one is sculpted pretty well considering their size. 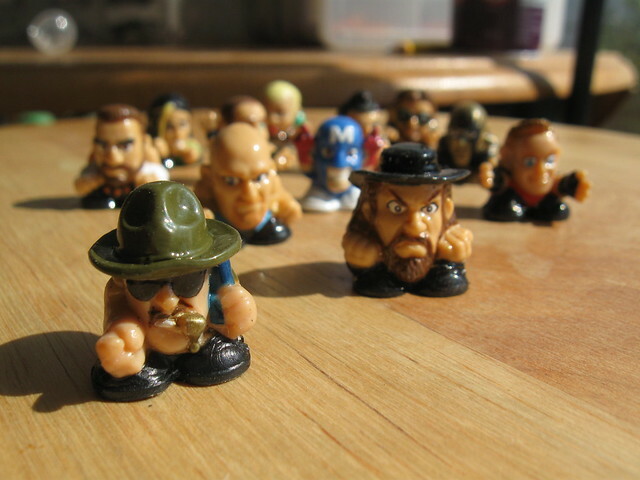 As a wrestling fan you can easily identify most the characters, my favorite being Sgt Slaughter. There’s a hole in the bottom of each one that suggests they could be used a pencil topper but none of them fit very well on the pencils I had laying around…I must have adult-sized pencils. You know that's Sgt Slaughter, but the Undertaker just looks Amish...and angry. On the surface it seems like Squinkies are just little action figures that don’t do much. I can see how they’d be fun little desk statues or something but their size seems to suggest you should do more with them, like there is some sort of game that goes along with them. A little investigation around the other toy aisles and I found that there are, of course, playsets for your Squinkies. They reminded me of when I collected MUSCLE Men as a kid. MUSCLE Men didn’t do much of anything either but they had a wrestling ring that you could use to slingshot your figures across the room that made for minutes of fun. Even with the playsets, I feel that anything you collect in mass quantity like Squinkies should have a game built around them. A card game, dice game…something that makes you want to play with your friends and collect more pieces for more than the reason to just have more. Of course, such games should also have some risk so that you lose Squinkies to other players. Collecting to collect has its merits but isn’t more fun when you collect to be the best? No torso? No problem...Stone Cold will still open up a can. I’m sure Squinkies will end up being just another collecting toy fad in the long run as few things seem to have staying power like collecting Pokemon, but I can see how collecting these would be fun when you’re young. Yet even for adults Squinkies are a cheap toy that can put a smile on just about anyone’s face. Of course, shrinking anything down to the size of a dime instantly makes it cute, fun and collectible…just ask the Japanese.